Approved URL: www.bigoven.com/article/recipe/ ERROR: That keyword is in use by another article. Choose another. If you don't want BigOven to automatically include a "BigOven Editorial Team" attribution below the published article, simply include the text "About the author" at the end of the article. This venerable grain is a chief staple food for almost half the world's population, particularly in China, India, Indonesia and Japan. While grown on hillside terrains in many tropical and subtropical areas (including the U.S.), rice throughout much of Asia is still paddy-grown in flooded fields using traditional techniques. Carried out by hand, these prolific harvests produce wonderfully aromatic, high quality rice varieties essential to everyday meals or recipes with exotic flair. This ancient grain has been cultivated since at least 5000 BC. Archaeological digs in China have uncovered sealed pots of rice that are almost 8,000 years old. There are more than 7,000 varieties of rice grown around the world, but commercially speaking, rice can be broadly classified by its color (white or brown) and size (long-, short- or medium-grained). White rice has the husk, germ and bran removed. It is available in regular (sometimes called polished) as well as instant and converted or parboiled varieties. Instant (quick-cook) rice has been fully or partially cooked and dehydrated, so it only takes a few minutes to prepare. While convenient, its flavor and texture is not as good as regular rice. Converted or parboiled rice has been soaked, steamed and dried before milling. This process creates a fluffy, separated rice that retains more nutrients and vitamins. It is pale beige in color and takes slightly longer to cook than regular white rice. Brown rice is the entire grain with only the outer inedible husk removed. With a high-fiber bran coating, it's more nutritious as well as nutlike and chewy in texture. It takes longer to cook than regular white rice, but there are some tasty quick or instant brown rice brands on the market. Basmati—This exotic variety from East India is aged to reduce moisture content and enhance its perfumy aroma. Basmati means "queen of fragrance." 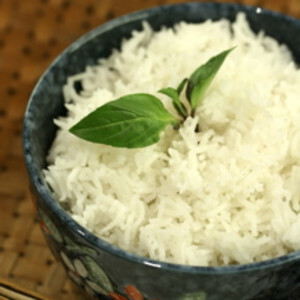 Jasmine—This Thai rice releases a wonderful aroma during cooking. It is comparable to basmati rice in flavor and fragrance, and much less expensive. Carolina—Grown primarily in California, Texas, Louisiana and Arkansas, this highly versatile rice remains firm, fluffy and separate when cooked. Short-grained rice has fat, round grains that contain more starch than both long- and medium-grained varieties. When cooked, it's quite moist and the grains tend to stick together. Also called pearl rice or glutinous rice, short-grained rice is preferred in the Orient because it's easily handled with chopsticks. Arborio—This Italian-grown variety is traditionally used in making risotto. The high starch content gives the dish its distinctive creaminess.